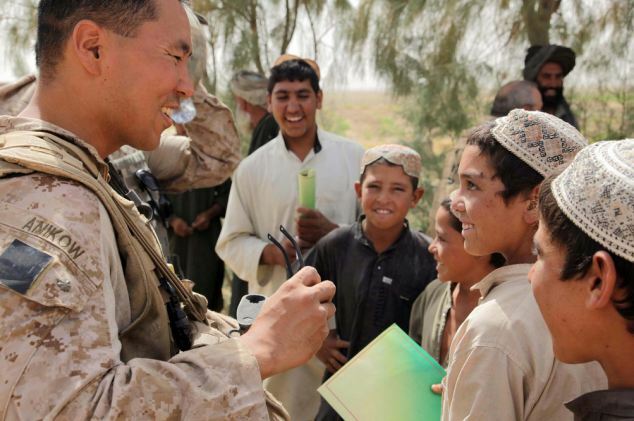 Major George Anikow on a tour of duty in Helmand Province, Afghanistan. The Supreme Court has dismissed a Makati City judge for “gross ignorance” after he downgraded murder charges against two men accused of slaying a US Marine. Major George Anikow, aged 41, was stabbed to death outside his home in an upmarket Makati City subdivision in November 2012. Three businessmen and one student were charged with killing the father-of-three, who had served in Afghanistan before being posted to the Philippines where his wife, Laura, worked at a diplomat at the US Embassy. In a 13-page decision released today (Monday, April 30), the high court found Judge Winlove Dumayas guilty of “gross ignorance of the law” and “gross misconduct” for his decision in 2014 to downgrade charges against two of the accused — Crispin de la Paz and Galicano Datu III — from murder to homicide. The court’s judgement also criticised the unduly lenient prison sentences imposed by Dumayas, which made the accused eligible for probation. “He granted the separate applications for probation of Dela Paz and Datu, effectively sparing them from suffering the penalties they rightfully deserve. The pattern of said acts appears to be deliberate, calculated, and meant to unduly favour the accused,” the court ruled. The high court also pointed out that 13 other administrative cases were filed against Dumayas between 2003 and 2016. “The court takes the aforementioned incidents as evidence of respondent’s stubborn propensity not to follow the rule of law and procedure in rendering judgments and orders. This definitely has besmirched the integrity and seriously compromised the reputation, not only of his court, but more importantly, of the entire judicial system which he represents,” it added. The court also said that Dumayas committed “oppressive disregard of the basic requirements of due process” when he sentenced the accused to the lesser charge of homicide on the basis that they acted in self defence. However, the accused had not themselves claimed to be acting in self defence. As well as dismissing the judge, the court also ordered the forfeiture of his retirement benefits. Dumayas was due to retire this year.